April 21, 2007: Sunny and warm, Water Temp warming to 60* . I got on the lake early this morning to catch bait before the weekend warriors could beat me to the bait. 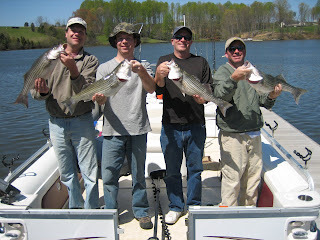 Every week it seems like there are more and more Striper fisherman on the lake. Spoke to client yesterday and we were suppose to meet at 6am but they decided to take a tour of Orange county and were 45 minutes late. I had all but given up on them after calling his cell phone 3 times so I started putting out baits in front of the marina when 4 guys drove up and waved . I saluted them and picked them up and ran uplake . We set up on a shallow flat and pulled a few points. 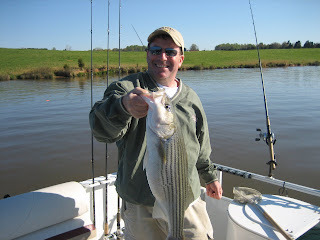 We had 6 hits within an hour boating a few Stripers but the Saturday boat traffic was getting pretty bad and after a Bass boater cut off one of my lines with his prop I knew it was time to move. We saw plenty of fish up there but there was too much noise for the fish to eat. We went back to midlake and decided to fish off the bottom since the traffic was so bad. We made a good move and started nailing nice Stripers. 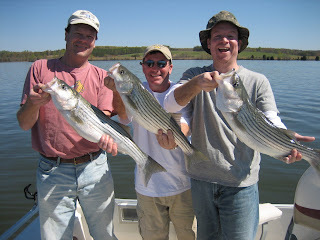 I pulled up to one spot and clients had 3 fish on at once [picture of Jeff , David and Greg holding fish]. I lost count of how many fish we caught [clients released fish] but we had about 20 hits and enjoyed a beautiful Spring day.